Last night a huge thunderstorm woke me up in the middle of the night. For some reason I realized then that I had no good idea of why rain almost always accompanies lightning (and thunder). What about the two processes makes them work together as they do? A bit of internet research yielded a logical if not entirely complete picture. HowStuffWorks.com has a very thorough discussion of lightning. We all know that lightning is the discharge of an electric potential built up between either two clouds or a cloud and the ground. Interestingly enough, though, we don’t completely understand how those clouds get charged in the first place. The current (and best supported) hypothesis is that, within the cloud, rising and condensing water vapor collides with falling ice crystals and loses a few electrons in the process. These electrons fall down with the ice to the bottom of the cloud, causing the lower region to become negatively charged and thus the upper region to become positively charged. As the lower region of a cloud becomes negatively charged, it also causes the ground to become positively charged. At a certain point, these electric potentials become so large that they discharge in the form of lightning. 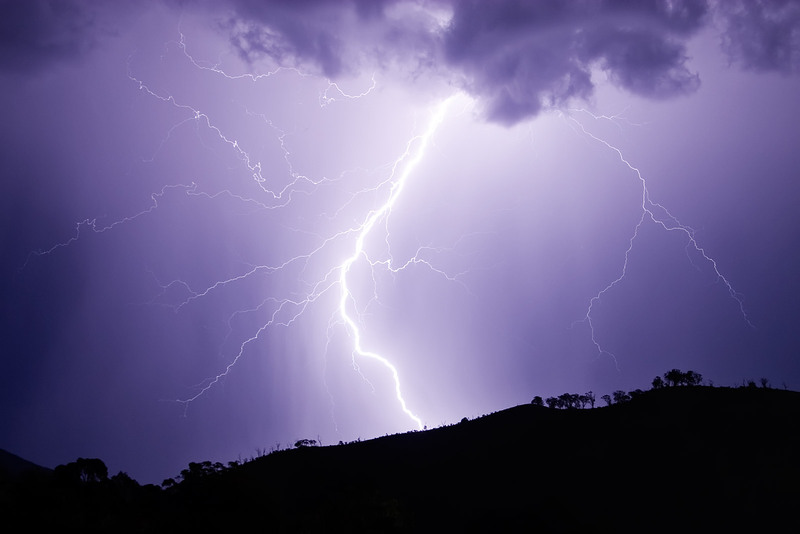 Through this collision theory of cloud-charging, the relationship between precipitation and lightning become more clear. The more precipitation moving around in a cloud, the more separation of charge occurring. Thus, thunderheads that produce a lot of lightning must have had a lot of precipitation in them to create that electric potential. And that much precipitation rarely stays up in the cloud. A number of climate scientists have actually tried to correlate lightning strikes and rainfall in storms. Vladimir Rakov and Martin Uman, in their book Lightning: physics and effects, discuss some of these efforts. While some scientists seem to have a bit of consistency. Rakov and Uman present data (the numbers are in kg of rainfall per ground flash) from a large number of studies that ranges in four orders of magnitude. It seems that specific types of storms (especially in the same area) yield far more consistent results than generalized storms. Again, I return to a familiar theme of mine. So many commonplace things operate in ways we don’t entirely understand. The next time you see lightning, think of those colliding water and ice particles.